The New York / New Jersey Metro ChannelPro SMB Forum will be a full-day live event and feature presentations from some of the top SMB resellers and managed service providers in the country, sharing their insights on the hottest tech solutions in the SMB marketplace today. Step into a sophisticated stay at Renaissance Woodbridge Hotel. Situated between Edison and Woodbridge Township, our Iselin, New Jersey hotel is surrounded by popular attractions including Menlo Park Museum and Rutgers University. The dynamic sights and sounds of New York City are just a short train ride away. Book directly within the ChannelPro SMB Forum group room block by CLICKING HERE or dial 732-634-3600 to make your reservations by phone. Be sure to reference the ChannelPro SMB Forum group when you make your reservation to receive the discounted room rate. Note: The Renaissance Woodbridge Hotel does not provide complimentary airport shuttle service. Kris Hansen is the Sr. Product Strategist at Solarwinds MSP. Josh Harrison has been with Eaton for three years as a inside sales manager, supporting the Northeast Territory. Josh supports Eaton’s resellers by driving sales, evangelizing the company's power portfolio and driving specification with end users. Colman O'Brien, Business Development Executive at Data Deposit Box, has been in the investment industry for over 30 years. A computer engineer by training, he has managed various firms in the Canadian investment business – his last position being at TD Bank as SVP. He has also chaired a public company. Click to play the full video "ChannelPro Forum 2017 Iselin Silver Selfie Video"
The ChannelPro SMB Forum is a FREE event for qualified attendees. Because seating at our events are limited and we must create your resource materials (white papers, action plans, etc.) and prepare meals for the day, registrants may be charged a reservation fee that will be REFUNDED after you attend the event. A major credit card is required to processes this fee during our secure checkout and will be refunded back to the card provided after you attend. 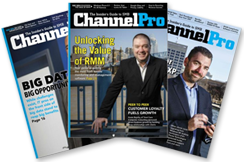 Registration for ChannelPro SMB Forum 2017: New York / New Jersey Metro is OPEN! Click here to register.